Which cartridge to go for? Compatible vs Remanufactured vs OEM - What's the difference? OEM stands for ‘Original Equipment Manufacturer', meaning a cartridge manufactured by the same company as the printer. Compatible cartridges are brand new cartridges manufactured by an independent company. These cartridges, therefore, have never been used before and are usually imported from the USA or China. This is an empty or used original cartridge which has been recycled, refilled and refurbished. Remanufactured cartridges contain the same quality and quantity of ink or toner as original cartridges, although that doesn't necessarily mean they will produce exactly the same results. Remanufactured cartridges supplied by us are 100% guaranteed and should perform to the same standards as their OEM equivalents. 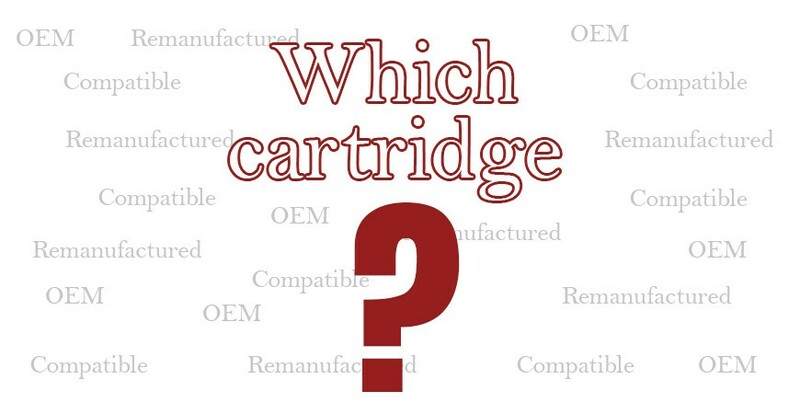 A cartridge should only be remanufactured once. We find that our suppliers are increasingly moving towards remanufactured products. The overall quality is better and this shows up in the reduced number of returns (which, by the way, are running at under 1%), although the prices are slightly higher than compatibles. The majority of our remanufactured products are made in the UK, which probably accounts for the better figures. Plus, it makes us feel good! In our experience, the savings of remans/compats over OEMs far outweighs the potential downside of "more problems". It is not unusual for the OEM versions to be 3 or 4 times the cost. Take an average company with 4 midrange printers - 2 b/w and 2 colour. That's 10 cartridges in total and if they all are replaced twice a year then the following figures can be assumed. A massive saving of £1640! I have erred on the conservative side with these figures, but even as they stand, that saving is a significant amount of money and surely worth a small amount of extra hassle.